In the toughest times of trials, when our Ukraine was deprived of all its good, our grandfathers and great-grandfathers did not lose the treasure of faith. That is why our Church during these 1030 years was not only a defender, the soul of the Ukrainian people, was not only a state-owned Church, but also a state-building Church. This was emphasized by the Father and Head of the Ukrainian Greek-Catholic Church, His Beatitude Sviatoslav, in front of а hundred thousand community of believers at the National Pilgrimage to Zarvanytsia. The Pilgrimage to Zarvanytsia, which this year is devoted to the 1030th anniversary of the Baptism of Rus’-Ukraine, was attended by the faithful from all over Ukraine and the whole world: the countries of Europe, the USA, Canada, Argentina, and Australia. The Hierarchical Divine Liturgy was headed by the Father and Head of the UGCC. His Beatitude Sviatoslav prayed for peace and integrity of Ukraine. Аlso, the President of Ukraine Petro Poroshenko came to pray there. Numerous pilgrims congratulated the Head of State with applause. In his sermon to the faithful, the Primate of the Church noted that faith is the greatest treasure as the Gospel of today proclaimes. "When a person knows Who is the only Оne to fulfill his dream, when a person can touch Someone he is looking for, more than that, when a person can let his dreams touch upon him, then miracles occur," said the Head of the Church. We came here from different corners of Ukraine and the world to celebrate the 1030th anniversary of the Baptism of Ukraine. "And today, in Zarvanytsia, we thank that for the period of 1030 years, in our families, the gift of the Christian faith has been passed down as the greatest treasure. Today we thank God that it was the Ukrainian Greek Catholic Church who was privileged to be a successor to Prince Vоlоdуmуr and his holy Baptism," said the preacher. "In the most difficult times of the trials," said the preacher, "at the time of the Tartar invasion, during the time of foreign reigns, when our Ukraine, our land was deprived of all its good, our grandfathers and great-grandfathers did not lose the treasure of faith." "Even when there was no other earthly institution," continued the Primate, "which could protect the rights of our people, the shepherds and leaders of our Church became the voice of the nation, which was denied of the right to exist. It was because of the fact that the Church made it possible for every Ukrainian to touch upon Jesus. Therefore, in the times of the Soviet Union, when the other Churches - heirs of Volodymyr’s Baptism ceased to represent the interests of their people, it was our Church that turned into the largest group of social opposition to the atheistic communist rule. We were able to survive as a nation from the dissolution among the so-called Soviet people. And we as the Church, came out as winners over the godless atheistic regime." Pilgrims also come to this holy place as the preacher said to meet not only with each other, but first of all to meet with The Most Blessed Virgin Mary, with our Mother, who never left us. In order to pray before Her wonder-working Zarvanуts’ka icon, an icon that is a witness of all the above-said. "Let us ask the Mother of God, so that through Her prayers, through the intercession and prayers of the faithful hearts in our Сhurch, the Lord would touch all of our people. That the thing we pray and dream of would become a reality in our lives," asked the Head of the Church. 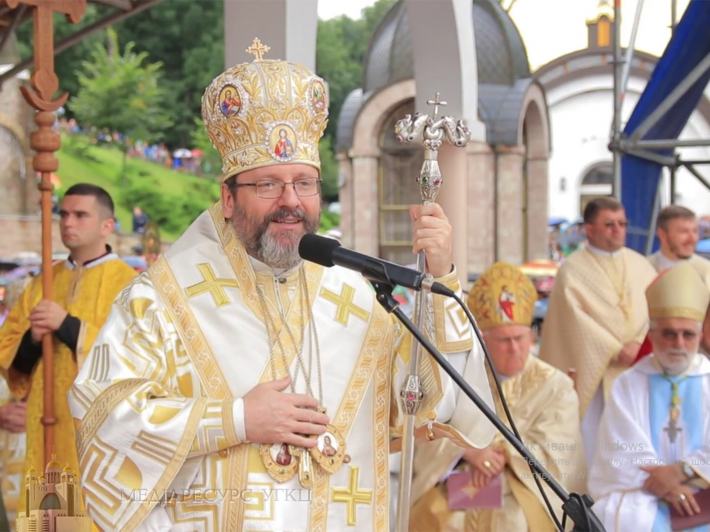 Cardinal Gualtіero Bassettі, President of the Italian Episcopal Conference, in whose diocese in Italy today there are about half a million Ukrainians, also prayed in the Liturgy. "I think,” said the patriarch, “not one Italian pastor asks Ukrainians ‘what do you dream of?’” What do Ukrainians dream of today? First of all, they dream of peace. They brought for today's Pilgrimage, perhaps, the greatest desire - the desire to end the war. People are able to start a war, but the peace comes only from God." Ukrainians have another dream, the Primate noted. "Here we have a monument to the Ukrainian migrant workers. To Argentina, Canada, and the United States, their ancestors traveled a hundred years ago. But they took with them the largest national treasure of Ukraine - faith in God. And Ukrainians are dreaming today that Ukraine would never lose that treasure," said His Beatitude Sviatoslav. The Head of the Church stressed that the greatest treasure we received from Prince Vоlоdуmуr was the key to our victory, a guarantee that Ukraine was, is and will be. But only when it remains Christian.